If you were to conduct a survey of every business in the world, 100 percent would agree that you have to have customers to be successful. Whatever product or service a business offers, it exists to serve the customer. Unfortunately, this has led many to the pursuit of simply gaining more customers. Any efforts towards retention and customer advocacy are left to simmer on the back burner. What lasting brands have figured out, however, is that the key to thriving and gaining customers is to focus on building an emotional connection with the customers they already have. The quality of your product is certainly important. But what keeps your customers coming back and bringing their friends are the emotions you inspire and sense of camaraderie they feel with other customers. By fostering this connection, you can increase customer advocacy and evolve from simply selling products to building a community. How emotional connections encourage customer retention. How to build a sense of belonging with your customers. Why marketers in higher education don’t experience the same kind of industry competition. How to conduct effective surveys to understand your audience better. What is one of your favorite things to do in Buffalo? Joseph is a huge fan of the arts and recommends checking out several galleries, including Albright-Knox, Hallwalls, and Burchfield Penney! 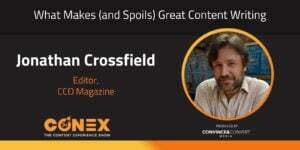 Randy Frisch: Welcome to Conex, The Content Experience Show. I'm Randy Frisch. Anna, thanks so much for being here with me. We get to tell everyone about a fun one today. This is gonna take everyone back to the school days, back to the days where we were away at university, having a good time. But also allows us to reminisce because we're all alumnis of the schools that we went to. Anna, what school did you go to? Anna Hrach: I went to Northern Arizona University. I love it, but ... I loved it. I had a great time there. Randy Frisch: Yeah, and I went to McGill University for my undergrad, which is really what I think of my university experience. Don't get me wrong, I had a great time there, but if I'm gonna be honest, I don't know if my school did a great job turning me into an advocate in finding ways to embrace me as part of their alumni. Today, our guest Joseph DiDomizio. He actually goes in to talk about how they're doing this really well at University of Buffalo. I was really amazed at how content and how our go-to market has gotten a lot more sophisticated in the upper education world. Anna Hrach: Yeah, especially when you're looking at just the other side as well. There's so much focus on reaching out to students, but when you're talking about the alumni side of things, there's more than just the typical phone calls that we get to donate, or take 10 minutes to talk to a student. There's a whole world and channel set available to us that people are really not utilizing today. Randy Frisch: Absolutely. During this podcast, we'll hit on some of the channels that they're managing to use to create, as I like to call it, advocates at the end of the day. Don't think of this podcast as one that's only for you if you work in a higher education environment. This is how do we take people who have had an experience with your brand, and turn them into people who continue to spread the good vibes that you're out there creating. I think this was a real key takeaway for me, in terms of what can we do here at my own company to embrace our biggest fans. Anna Hrach: Yeah. I mean advocates are what continues to drive sales and engagement. It's funny, we do ... I mean classic marketing mistake, we focus so much on acquiring customers and acquiring students, that we don't actually think about sometimes keeping the ones that we already have. That's a massive ... It costs way more. We know this from studies. It costs way more to acquire a customer than it does to keep one. Really interesting. Randy Frisch: Absolutely. Let's roll with the podcast. I believe you got to bring in Joseph, so let's let that play. Anna Hrach: Joseph, thank you so much for joining us today. It's so great to have you here. Joseph DiDomizio: Thanks for having me. It's a pleasure to be here with you all. Anna Hrach: Yeah. Really excited. We know a little bit about you from chit chatting before we started recording, but just so everybody else out there knows more about you too, go ahead and introduce yourself. Joseph DiDomizio: I'm Joseph DiDomizio. I'm the Director of Digital Communications at the University of Buffalo in the office of Donor and Alumni Communications, and a division of University Advancement. Anna Hrach: Nice. Donor Alumni Communication, that's different. We've talked to a couple of people from universities before, and our emphasis with them has always been on the student side, but you're actually on the donor and alumni side, which is super fascinating. Joseph DiDomizio: Yeah. It's sometimes a little bit overlooked when everyone thinks of university marketing. I think it falls a little bit more in line with [inaudible 00:03:44] not profit marketing because everyone assumes you're asking for money, you're looking for engagement. I mean, that's kind of what we do, but there's a lot more to that. When you buy into a college, you're also really buying the alumni lifestyle afterwards, and everything that comes with that degree. Our job is to continue the excitement, the pride, the engagement that you had when you were just a student, essentially learning the product, if you can think of it that way, throughout the rest of your life, as long as you want to be involved with it, which is hopefully for the rest of your life. It's such a foundational piece of your life when you buy into it. Anna Hrach: It is funny that you mention that, because you're right. A lot of times people pick universities based on legacy, like their parents went there, and their grandparents went there. Or they pick it based on their sports team. There's so much emotional investment. Or they pick it because this university is the best in this X degree, and there's so much emotional investment that goes into selecting a college, selecting a university. Then you graduate and from what I've seen, the majority of universities are just like maybe once a year phone call for some donations and things like that. It seems like that's definitely not the right way to approach it. Joseph DiDomizio: Yeah, it's definitely the way that we'd like to flip that around. I know there are a lot of other universities who have already taken up that challenge and embedded this, baked this into some of their targets and their goals. But it's something that we haven't really jumped on too much here, at the University of Buffalo, but I think that we're definitely ready to do it, and I know that it's something that we really believe in. We think that that relationship is something that can be fostered continuously, and should be fostered from the day that you are an accepted student and beyond. When you unpack those reasons that you listed earlier about all the sports teams, or legacy situation, or what have you, those are all still based on really, really concrete and deep emotional triggers that definitely has some resonance in the post-graduate lifestyle. 'Cause it's only four years, or sometimes six, or eight or ten, and depending on the degree that you're getting, that you're really here, out of your average lifespan that could be maybe a tenth to an eighth, depending. But you're carrying all these other emotions along with you for the rest of your life. It's a huge opportunity for us to continue to keep those kinds of emotions flowing, and those kinds of deep identity related pieces in the forefront of everyone's minds, to keep that relationship moving forward, to be able to give more to the students coming in, to help create a bigger tribe on the long-term. Randy Frisch: Yeah, it's interesting as you jump into this. First off, Anna, I got to say even what you're describing is so much more than the connection that I've continued with where I went to university. My definition of being an alumni is that I've got my graduation diploma up on a wall. That to me is like ... Or if I see someone and they're at that school I'm like, "I went there." It's almost like I can relate to you type of vibe. I like what you're trying to achieve, Joseph. I would compare it, for those listening who maybe aren't in the education world, it's how does a brand create an environment or a club, if you will, that people want to belong to. Some of the brands that I always admire [inaudible 00:07:15] automobile companies. Those people who have bought a Jeep are part of this club of Jeep owners, and they all have this pride associated with it, that they've driven a Jeep. I think Porsche has something similar. I think Land Rover's tried to accomplish the same type of thing. Is it fair to say that your goal is to create this exclusive belonging of those who have been there in the past? Joseph DiDomizio: Absolutely. I think that's very fair. I think though, we're not actually creating it though. I think that it exists. It just hasn't been fostered enough, or encouraged, or strengthened over long periods of time in a collaborative way to be able to make it effective for our goals as an organization, which would be to engage our alums, continue supporting the incoming students who expand that club, and to continue giving opportunities to folks who wouldn't normally have it. I think that's easily translatable to any business' growth plan, to be able to have your brand be something people want to belong to. Since we've already got point of purchase at a college and you're here, it makes sense that we need to be continuing that 360 touch point afterwards too. A lot of colleges aren't the best at that. There are a lot of colleges out there, and there are some college that do a really good job. We want to be one of those colleges that are doing a really good job, one of those universities. Randy Frisch: It's interesting how you said at the beginning of that little bit was that it already exists. It's on us to highlight it. You're probably right. As we talk about our own university experiences, and I'd tell you how when I hear someone who's gone to the place I went to, I have this bond with them instantly. How are you finding ways to highlight these groups, and bring people together, maybe more out in the open, where it encourages your ultimate goal, which is support of the school? 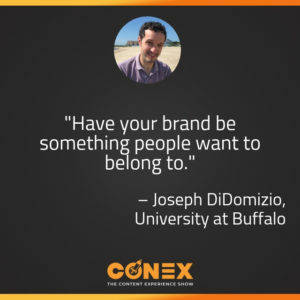 Joseph DiDomizio: A lot of that comes through affinity marketing, and looking at behaviors, and doing the usual content marketing stuff where you're trying to develop personas around interests, and behaviors, and understanding your audience so we know what they want, and we can put together and highlight those pieces that exists for them. We just finishing an alumni results survey so we have a couple really great clues as to where our content should be going. We want to dive deeper into that and sort out what we can offer in a more robust way. We're in campaign right now too, so we want to be able to make sure that what we're doing is also linking back to what we have available for donor opportunities. We're trying to develop the programming and high value pieces to get folks interested and stay interested in it, things that build their pride and continue to highlight what we're doing such a good job of. We're triggering nostalgic pieces like Throwback Thursday, as a programming idea, has been really great for us for engagement. It's great for everybody, but as a university, you can put out a question that asks, "Well what was your first day of classes?" You'd guarantee to get responses base on that, and you're guaranteed to find information and understand that these folks might be interested in coming back if you see a bunch of people from 1980, they might also be interested in other topics that you're doing. You can start building lists based upon what topics they've responded to already, and if you had a research post or something, and start identifying funds, and everything else like that to goose their interest levels in certain targeted ways. We're trying to do this from a programming standpoint of providing the value with webinars, and fun pride posts, and then building that back into a later higher level ask where folks seem to be more prepared to engage as they get further right on the donor spectrum, as it were. Anna Hrach: Nice. I'm so excited to hear more about this survey because this is something that Randy and I have talked about a lot which is just how much information and how many ideas can be sparked just by talking to your audiences, and actually just asking them what they want. But before we get into that, we are going to take a super quick break. But when we come back, we're gonna talk more about the survey, and how you conducted it, and just even more of the learnings that were found. Everybody stick with us real quick, we're gonna take a quick break, and we'll be right back. Growing your business is tough, as they're expensive and let's face it, social media is hard. The best way to grow is to have your customers do it for you via word of mouth. But you have to give people a consistent and memorable story to tell. That story is your talk trigger. Jay Baer's new book shows you exactly how to do it. It is the complete guide to creating customers with word of mouth, and it's available now wherever you get books. It's called Talk Triggers, and it's easy to find. It's the one with the alpacas on the cover. Visit TalkTriggers.com today, or get it wherever you find books. Joseph, welcome back and thank you for talking to us again today. Before the break, we started to talk about this survey, and all of these amazing things that you found like Throwback Thursday. Tell us a little more about how you actually conducted this survey and actually reached out to these alumni. Because I think as we mentioned before the break, this is such a critical component to getting our content right, and you found gold with this survey. How did you actually go about putting it together and distributing it, and getting results? Joseph DiDomizio: Well we contracted with a third-party to do the survey, 'cause like many shops, we don't have a survey team on-board. Although I'm sure we would like it in the magical world of unlimited funding. Every two years we do this survey. We have some generally updated data, and it's most sent out on email over the phone. It isn't too much in-person, but we get a statistically decent enough amount of responses to be able to direct some of programing questions, to direct some of our demographic and communication effectiveness programs. Like we got some good feedback where our audiences are getting their information from, and whether it be web or magazine, social media versus direct mail, and what age groups identify where they're getting most of it from, 'cause that's super important for us to know as the classes get bigger, where there's larger pools of alumni prefer to have their information delivered to them. We also identified what they would prefer to have as far as content and usefulness. Like what do they value from our organization after they graduate. A lot of that is unsurprisingly about careers. Folks are always looking for that particular component, and some ... This goes back to a earlier part of our conversation, where we talked about the graduation situation. A lot of colleges have recognized, and a lot of universities have recognized that we're not just here to educate, we're also here to help use the alumni network to employ, to help get folks into positions 'cause they recognize that being part of that club means we've all gone through some kind of struggle together at some point [inaudible 00:14:59] particular kind of person that can do a particular kind of thing. You can trust, at least, in that brand value. I know that happens with my alma mater, one of my alma maters, Syracuse, which I will name check. Also I'm a grad here at UB, to be completely fair. Both universities have helped me immensely, but Syracuse has a little bit different of an alumni connection with their grads, especially from the Newhouse School, where I was. I have worked at a couple other universities that had really strong alumni hands in a post-graduation employment pot where they were on campus recruiting for their organizations, or were happy to take interns, and such like that. That's the kind of network that we want to foster. We want to foster this opportunity to say, "Yeah, UB grads are there," and we do have employers who do that. We absolutely have in our engineering schools, and our medical school, and our college of arts and sciences, and all of our other schools we do have alumni that do that and strengthen our network every time they do, and that's brand building as well for us. It's the most important part of it, 'cause if we can deliver that kind of content and make them more aware that there are people getting this kind of success, and kind of success from their degree just because they know that they've been through this and this is what their time was spent doing is building these relationships as well as learning. Anna Hrach: I figured that alumni network or post-job outreach network was going to be a major piece of the findings. The nostalgia thing didn't surprise me necessarily too much, although kind of interesting how high that was. Were there any other big whoa or aha moments about some of the content they were looking for, or some of the content that really did resonate with them. But it's super interesting that that alumni network is so large. But anything else that popped up, you're like, "Oh, I didn't know that they wanted this type of content." Joseph DiDomizio: Honestly, no. Sorry. Anna Hrach: No, no. I mean, I think that just means that you know your audience, so congratulations. That's like golf clap for you guys. Joseph DiDomizio: I think there's a little bit more to unpack with that answer too. There wasn't any surprises because we've done the survey before, and the answers were the same. I don't know if that means that we know that we know our audience better than we have two or four years ago. I think maybe we haven't delivered well enough sometimes on that. 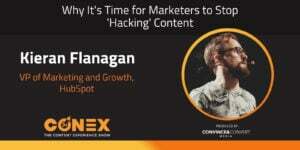 I'm not trying to throw anything, I'm not trying to be negative about anything here, but I think that's because we aren't doing the kind of content marketing that can give them the things that they need in the way that they want it, where they want it, and when they need it. We've recognized that that might be something we need to steer into, and dive a little bit deeper to make it a little bit better so we can find better nuggets like that. Randy Frisch: Yeah, no [inaudible 00:17:38]. First of all, I love the honestly. It's refreshing. As marketers as we try and cook up these amazing outcomes. But I'm wondering, 'cause I know you've got a decent size team for the university. I believe it is a digital team of two, you got a social media individual, yourself. I'm wondering, between that group, aside from survey where we're going out and asking, what data within the content consumption have you started to glance into to try and figure out how do I know what's working? Because sometimes when I'm asked these surveys, I'll just give the answers that I know I should say. But I'm wondering where you're actually seeing that on the flip side of actual now we go and execute but, what's actually working the best for you? Joseph DiDomizio: That's a great question. One of the things that have worked the best for us is terms of engagement, is in terms of excitement, has been our webinar series that our alumni office put together less than a year ago, maybe just a year. Within the last 18 months, for sure. They have started doing a consistent Wednesday Webinar series where they have alums, and they have sometimes recently graduated students, or industry experts talk about career topics every Wednesday in an hour long webinar. We have all of the archive on the web, we have pushes out for it and everything. It's essentially like a weekly podcast, which you guys seem to be familiar with. It has done really, really, really well for engagement whenever we put it out every week, and whenever we tout the archive. We have no issues with its performance, and it seems to be one of our highest performing rocks in our programmings schedule. It's purely careers. There's nothing else, there's no side ask, there's no, hey come to an event. It's boom this is just nice career stuff, and it seems like folks are really resonating to having that valued content, and we want to do more of it. I think we should be doing more of it and we can. Randy Frisch: That's an interesting comparison too, Joseph, because when you look at what this podcast is and when you look at a lot of the podcasts that are interview style, they're really just highlighting someone in their career accomplishments, as we're doing here with you. I think that's what a lot of us are really craving, is what can I learn from others who have taken the same path as me, or a path that I'm aspiring to head down. That's really, Anna, that's what we're trying to do here is, and myself, even being one of the hosts on this, my biggest takeaway is learning from all of our guests every. Joseph DiDomizio: Yeah. That's one of the nicest things I liked about coming into higher ed, is that I didn't come from higher ed originally. I came from pharmaceutical marketing, in a different kind of business, and media arts background. I came into higher ed by accident which is not an unfamiliar story for most people in higher ed. There's a collaborative and always learning atmosphere that's baked into the culture of being in a university or college that makes it really easy to copy and steal each other's [inaudible 00:21:03] all the time. 'Cause it doesn't feel as bad when you're doing it in a more cutthroat businessy sort of way. 'Cause folks are really open to having it happen. Everybody wants each other to succeed 'cause there's not perceived competition level at some certain point. I also can't take too much credit for that Wednesday Webinar series. We help amplify it, and we helped talk about it, but it's [inaudible 00:21:28] and the alumni team who really do [inaudible 00:21:31] work, and it was even their idea. I'm just happy it's working and being so awesome. It's fantastic. Anna Hrach: I love how you give credit where credit's due 'cause you totally could have stolen that idea and Randy nor I would have known. But maybe some people internally would have pitched a fit. Joseph, because you came from a background that wasn't always at the university, what are just some key tips and tricks you have for people? 'Cause the university environment is so different. There are so many more divisions, in some ways some more silos just because of the way funding works, and the way departments have been set up, and a lot of times there are these legacy systems where these processes, they are just so baked in and just different from that "corporate world". What are some of your top pieces of advice for coming into the university environment, and really trying to make change happen with content, and creating that experience? Joseph DiDomizio: A lot of it is like that most basic idea of buy-in, and getting the right people to buy-in across the board, and knowing who those folks are so you can't ... One of the things I see sometimes when folks come in to business, and I did it from a business side into higher ed is that the pace is different. When it isn't. It's just there's a completely different way of doing it. It's a lot more political. There's that old chestnut about the politics are so intense at universities because it matters so little, but it's kind of true. It wouldn't be an old chestnut if it wasn't. People do want it, they believe in what they're doing, and sometimes it's hard to get that change, 'cause folks are really into their expert roles. Understanding who they are and how they respond to certain kinds of change is really important. Having those face to face communication opportunities, getting the buy-in for what you want to, and explaining it to them on their terms from the 50,000 foot level, or 30,000 foot level where we're looking at it right now, also into the details when it's necessary to get them onboard to what you're trying to do, as often as you can. It's not easy, I'm not a natural extrovert by any stretch of the imagination, so I find that really difficult to do on a day to day basis, but it's necessary. If I want to do what we're trying to do here and [inaudible 00:23:58] all my communications with our colleagues, we have to be in front of folks a lot, and talk to them, and really explain what we're trying to do, and how it's gonna help them without them doing more work, but just a little bit differently. That's definitely number one, and that's something I know I've heard at conferences, I've heard from folks all across the board, and it's absolutely true. Then obviously having the executives on board is really great. But knowing your contacts and knowing if you're coming in from a place where it's day to day, it's fast, fast, fast, fast, fast, sometimes things will take six extra weeks because you have six extra stakeholders to check. That's how it is sometimes here, and not getting frustrated with it. That's a big challenge. That would probably be the number one piece of advice if you're looking to come int to higher ed and make those kinds of changes, 'cause everything else is still pretty basic stuff. It's still business focused. It's why I was going back and forth between the comparisons between what a normal business idea and then what a higher ed situation is. We're all looking for growth, we're all looking to support and promote our brand, and we're all looking to acquire and convert at the end of the day. Anna Hrach: Nice, so basically same ultimate end goal just a little bit different process to get there. Love it. Nice. Well, Joseph, thank you so much. We have gotten to know a lot about the professional side of you, but we're gonna have you stick around to learn more about the personal side of you, so we know you're a big fan of the arts and entertainment. We know there's a lot more to you than your day to day. Everybody stick around, and we are going to get to know a little bit more about Joseph. Randy Frisch: All right, Joseph, thanks a lot of sticking around here and letting us learn a little bit about you outside of the university. I figured since it's on you to sell Buffalo, in many ways, I'm gonna hit you with a two-part question. Number one, I'm from Toronto, right on the border. How do you feel about Canadians coming over the border to Buffalo all the time? That's part number one. Joseph DiDomizio: Number one. Randy Frisch: Part number two is what are your top two to three things to do in Buffalo? I know you got a couple of kids to enjoy the city. Joseph DiDomizio: Oh, okay. We'll let's start off by saying I love Toronto, I love going across the border to visit. I've had some of my best experiences and seen some of my best rock shows in Toronto. All the love for Toronto. Having folks come over is great. Please spend all your awesome Canadian dollars on the American side. Anna Hrach: And bring Kinder Surprise. Bring all the Kinder Surprise. Randy Frisch: Yeah, it was a little easier when the dollar was at par five, six years ago. Or maybe longer now. I may sound stupid with that comment but that's fair, that's fair. We'll keep visiting. We enjoy it there. Joseph DiDomizio: Next time just bring me some of those chocolate Smarties. I mean we have M&Ms, but those chocolate Smarties are completely different. Randy Frisch: Yeah, and to clarify for people, our definition of Smartie is very different than the definition of Smartie you guys have. I don't even know what yours is, but ours is the way a Smartie should be. Joseph DiDomizio: Our Smarties are straight sugar. Anna Hrach: Yeah. It's like pressed sugar versus a Smartie is more like an M&M, but better. Randy Frisch: But better. Joseph DiDomizio: It's got square edges. It's got [inaudible 00:27:21]. We could talk about the awesomeness of Smarties all day. I grew up with our public radio, public TV station WNED here in Buffalo. They broadcast a little bit to Toronto too, at least they used to. Definitely into Fort Erie, and Niagara Falls. We used to get commercials all the time on both sides like that, and also the paid stuff for Smarties. It took me about 10 years, until I was a teenager to be able to see what that candy actually tasted like, which is why I have such a nice place in my heart for it. Randy Frisch: All right, so now that we've talked about Smarties for a bit, maybe hit us with one of your favorite to-dos in Buffalo. Joseph DiDomizio: Like I mentioned, I love the arts. I do like going to the Albright-Knox art gallery. It's in the beginning of a new campaign and expansion with an architect who I think designed a museum up in Montreal, as well, not too long ago. It's got a wonderful collection that if anybody else is interested in the arts, they should absolutely be checking out. There's tons of really great galleries, and lots of really good experimental artists [inaudible 00:28:36] like Hallwalls, or Community Arts, Squeaky Wheel, or even across the street from the Albright-Knox at the Burchfield Penney, this really great wonderful local spotlighted artists and national artists always going on display there too, with a really great space, just massive work. I would definitely recommend coming down to see some of those events if you can. But as long as you're not going to a Leafs game, you can always just check out the Sabers if you want. Randy Frisch: That's [inaudible 00:29:04]. I actually went down to Buffalo for a hockey tournament with my kids last year, and we went to a Sabers game. It was a ton of fun. We had a good time. They were also one-tenth the prices of a Leaf ticket here in Toronto, so all [inaudible 00:29:18]. Joseph, thank you so much for taking the time to join us on the podcast, and especially for everyone who's tuned in to listen to this episode. If you've enjoyed this, please take a look at the contentexperienceshow.com, to see all of our past episodes, and check in on some of the other content and great guests that we've had. Very similar to how Joseph talked about with learning from alumni. That's what we're trying to do on this podcast, is learn from great marketers, and we thank you Joseph for being one of those that we can all learn from. 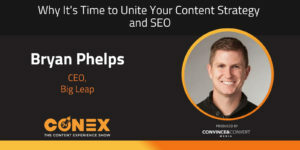 Until next time, I'm Randy Frisch from Uberflip, joined by Anna Hrach from Convince and Convert, and this has been the Conex Show.